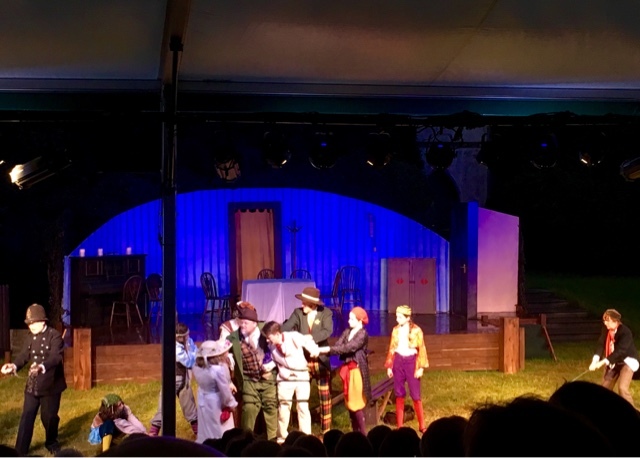 Bravo to the crew of the Chiltern Shakespeare Company for Wednesday night's performance. 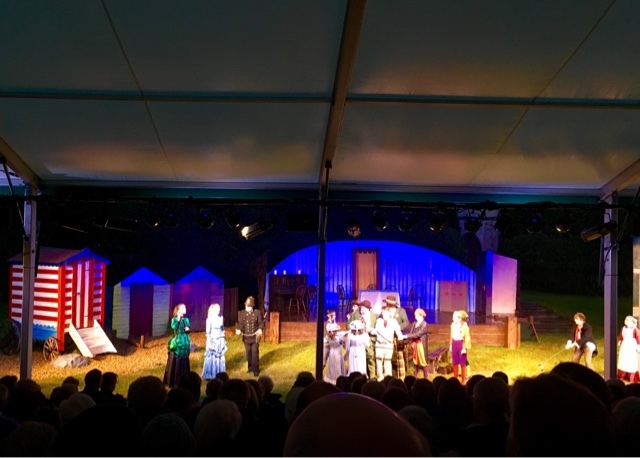 They honoured their craft by performing in pouring rain for the whole first part of the play. And what's more, they improvised and joked at the rain's expense, making everyone laugh. Spot the cascading rain dripping down from the spectators' tent? 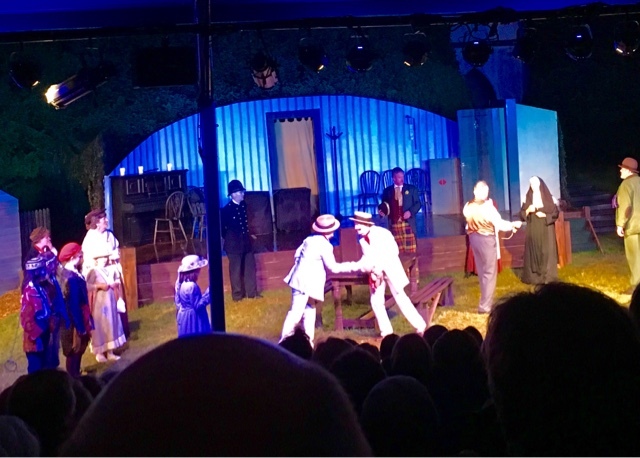 What I love about the performances of the Chiltern Shakespeare's Company is that they incorporate Hall Barn's majestic setting in their plays. 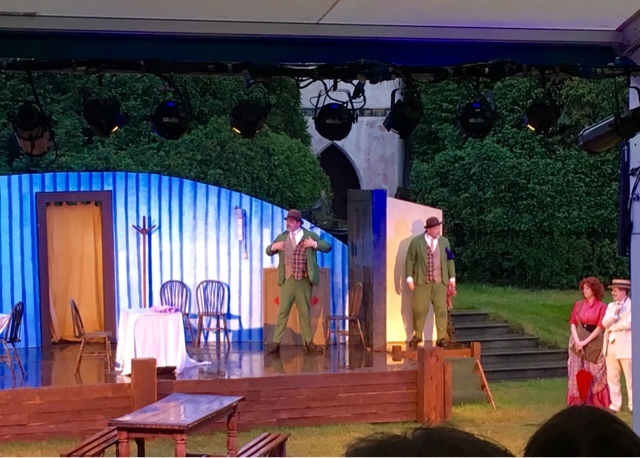 This time the green gardens transformed to a seaside Victorian resort where the comic-tragic Shakespearean story unfolded. 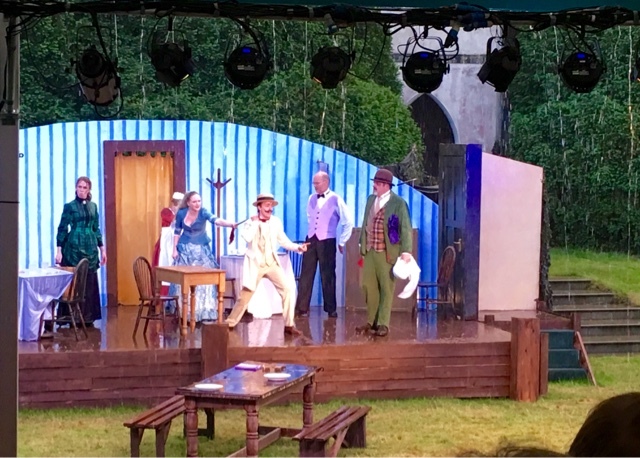 At some point, ten minutes into the first act, the rain was so heavy that it completely overpowered the actors' voices and little streams of water were running down from the spectator's tent. Oh yes, we were all comfy and dry, sipping away on our wine, while the brave cast members carried on with the comic errors that made us all sit up and lean forwards, in order to carry on watching. The story unfolded slowly and peaked right at the end of the second part. This is one of Shakespeare's earlier plays, shorter than the rest of them. Two sets of twins get separated at a young age and they are re-united after years, through a series of misunderstandings. Dromio of Syrracuse , one of the twins who served one of the other twins, Antipholus of Syrracuse, was a pure joy to watch and cheekily moved his performance under the spectators' tent, while it was pouring down. Off course he made a joke about it and the audience loved it! Where are you going to? Do you know?" was heard on a couple of occasions throughout the performance, to entice Antipholus of Syrracuse to think about his doings. Dromio of Syrracuse is just about to meet his long lost twin , Dromio of Ephesus. Last year it was the first time that I attended this summer outdoors performance and I loved it.